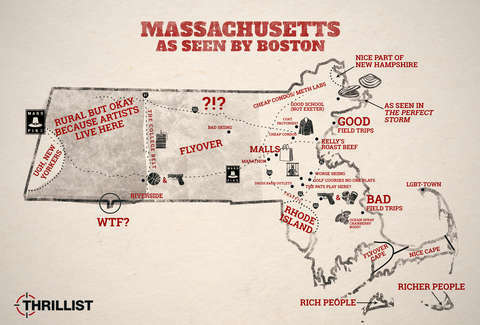 Massachusetts is shaped like America, which is fitting because, like America, the people living in the middle of the East Coast tend to think that everyones else is backwards, deadly, or just generally not worth paying attention to. There are some pockets that do attract the notice of Bostonians, of course, but that tends to be because other Bostonians go there, or there are good schools or artists, or maybe old loft condos marketed to artists that never really worked out. Or because they have amazing names, like Athol. The rest is just a bunch of towns ending in "-boro" that you have to drive through for hours to get to Mass MoCA.